At least 40 Indian soldiers were killed on Thursday in Indian-administered Kashmir in the deadliest attack on government forces in more than two years. 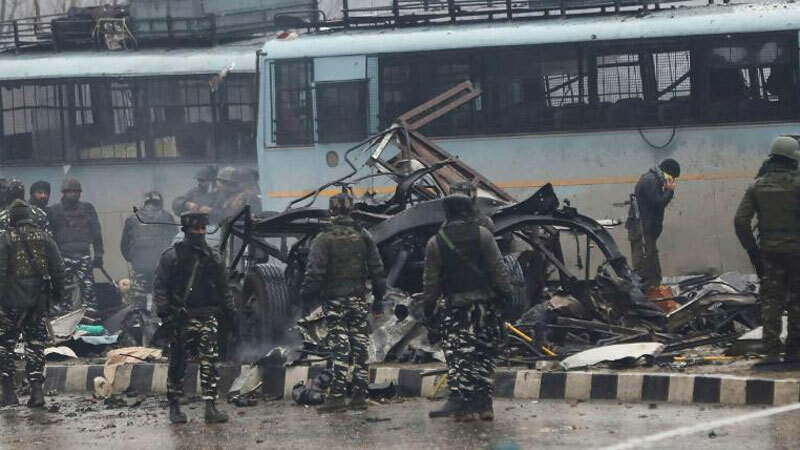 “Death toll in the Pulwama attack is around 40,” K Vijay Kumar, advisor to the Indian-administered Kashmir Governor"
Police said that it was an improvised explosive device (IED) while the CRPF said that the explosives were inside a car. Media reports said the explosive-laden vehicle was driven into the convoy. Two blue buses carrying around 35 people each bore the brunt of the explosion around 20 kilometres (12 miles) from the main city of Srinagar on the main highway towards Jammu. “It was a powerful explosion. The explosive was car-borne,” CRPF spokesman Sanjay Kumar told. Speaking on condition of anonymity, another CRPF official said at least 29 troops were injured in the blast, which damaged a number of vehicles in the convoy. Prime Minister Narendra Modi tweeted that the latest attack was “despicable”. “I strongly condemn this dastardly attack. The sacrifices of our brave security personnel shall not go in vain. The entire nation stands shoulder to shoulder with the families of the brave martyrs,” Modi said. It is the deadliest attack on Indian forces in that part of Kashmir since September 2016 when 19 soldiers were killed in a pre-dawn militant raid on the Uri army camp. India has an estimated 500,000 soldiers in Kashmir.